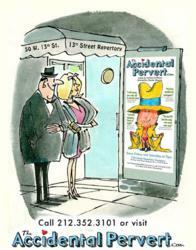 Hit off-Broadway play, The Accidental Pervert, has been so successful that it has been extended through June 29th. At its core, The Accidental Pervert is about relationships, and that's something everyone can relate to. Over the last few years, there's been a surprise hit in Manhattan. It's in the West Village, it's The Accidental Pervert, and it's hilarious. The show has been such a hit with New York audiences that it has been extended for a sixth time through June 29th, 2013. "People are still having trouble getting tickets to the show sometimes because we're selling out a lot of nights," writer and star of the play, Andrew Goffman says. "Yes, it's surprising it's still this popular and I'm really happy about it, but I'm just concentrating on giving the best performance I can every time I get up on stage." He must be doing a lot right, because this comedic coming of age story has been selling out the 13th St Repertory Theatre since 2009, during which time hundreds of other Broadway plays have come and gone. Andrew puts the success of The Accidental Pervert down to people engaging with the material. "At its core, The Accidental Pervert is about relationships, and that's something everyone can relate to." The Accidental Pervert is a laugh-filled show with a serious underlying theme. For three years, Andrew has been entertaining sold out crowds with the story of what happened after he found his Dad’s stash of adult videotapes when he was eleven years old. He takes the audience on a comic journey through his porninfluenced eyes, to reveal how his exposure to pornogrpahy overshadowed his relationships with women for many years, until he finally became a loving husband and father. The play is also running in Buenos Aires, starring the popular Argentine comic, Cabito.